I want to strangle whoever invented SBUX. And not just them, but whoever introduced me to it. And also whoever twists my arm each time I wander by a Target and get sucked in. The addiction is so bad, I have 3 Christmas mugs, 3 ornaments, and 2 plain red SBUX mugs. I can’t look away from the big green sign. This past weekend, we went back to Memphis to see Trans-Siberian Orchestra and I’ll get to those pictures in another post. But you should have heard me say “Is that a Starbucks? ?” each time I saw a green circle. I begged to go by our Germantown mall just to see if Gloria Jeans coffee shop was still there. Back when we were dating, Stephen loved to go get a coffee from GJ. Back when we didn’t have two nickels to rub together and regular flavored coffee without all the add ins was so cheap. Guess how fast I stepped after reading the directory? I had a skinny peppermint mocha in my hand so fast along with something new I thought I would try. Two Days. That’s how long it took before I made my own. 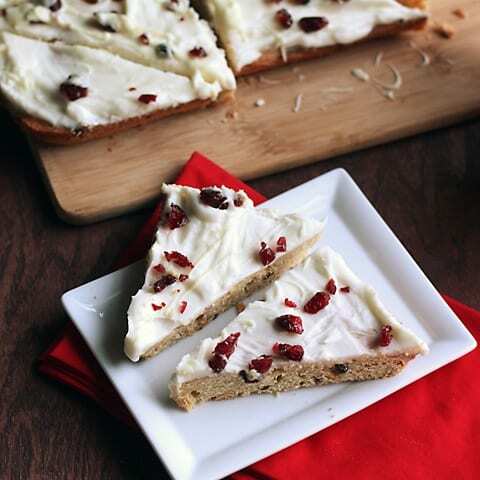 I loved the dense blondie type bottom layer and the thick cream cheese topping with the drizzle of white chocolate. Pure decadence. And I think I like mine better. I cut some sugar so they are not so sweet. 2. 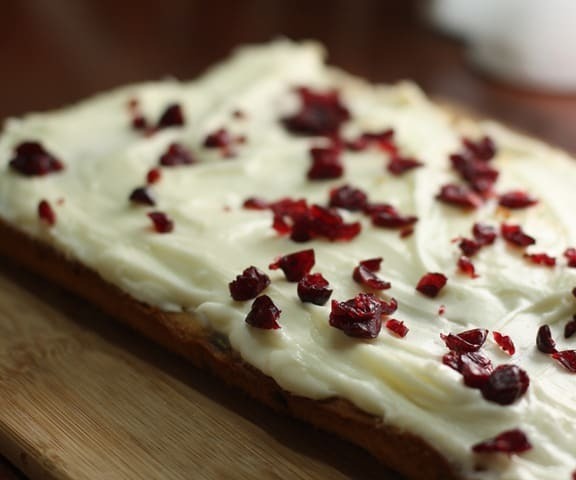 Make the blondie layer by beating the room temperature butter and brown sugar together with mixer. Add the eggs, ginger, orange and salt. Mix well. Gradually mix in flour and baking powder. 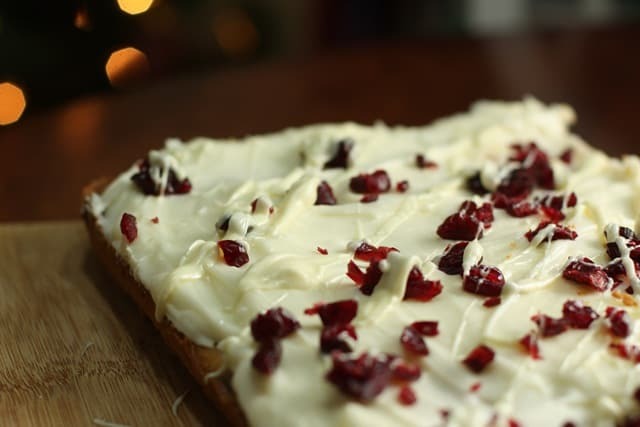 Mix in the cranberries and white chocolate by hand. 3. Spread the blondie batter into the prepared pan. Bake for 21-25 minutes or until a toothpick inserted near the center comes out clean (do not overbake). Cool completely on a wire rack. 4. 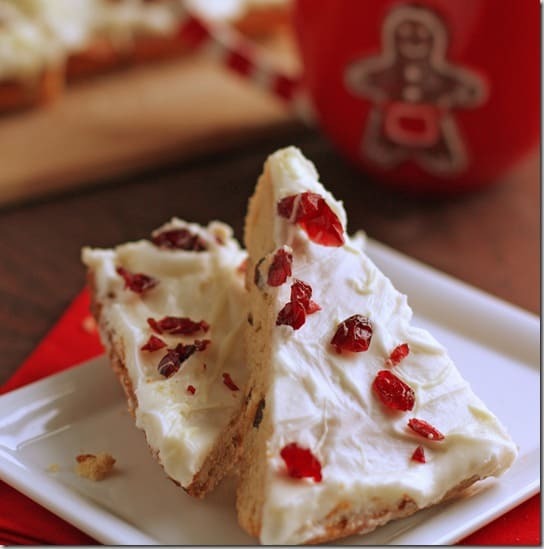 Prepare the frosting: In a large bowl, use an electric mixer to beat the cream cheese, orange extract, and powdered sugar until well-blended. Gradually add half of the melted white chocolate; beat until blended. Frost brownies. 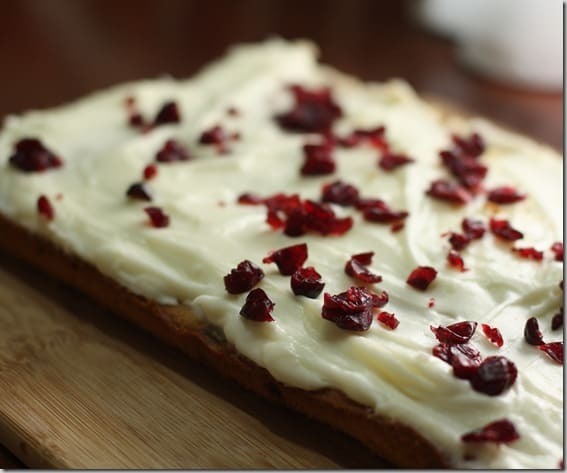 Sprinkle with cranberries. Drizzle with remaining melted white chocolate. Cut into bars- square or triangle-shaped. Store in the refrigerator until ready to serve. Source: Recipe Girl.com (Adapted slightly from Taste of Home) and Top Secret Recipes. I saw your tweets about Tastespotting. Know why I love Pinterest and StumbleUpon? The food photo sites barely matter anymore. It’s real people who like our stuff and that dirty word ‘Composition’ is not a part of my vocabulary anymore. I seldom even bother with submitting. Ah…FREEDOM! I am ALL over these! Yum! They look divine! And I lovveeee Starbucks too! This is so fun and cute! I love that it represents Starbucks’s. My dad always comes home with the little triangle bars and I have trouble resisiting… even though I can taste the shortening. A friend introduced me to these this year (curses on her!) and now I cannot resist getting one when I pass a Starbucks. I feel your pain! I can tell after only one bite how horribly fattening they probably are for me, but I don’t care. YUM!